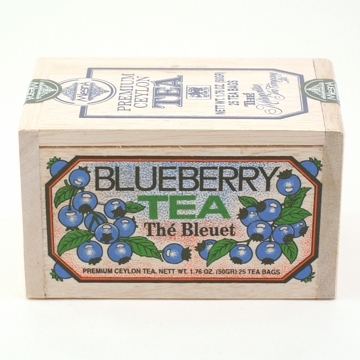 Blueberry Tea from the Metropolitan Tea Company is a delightful blend of natural blueberry flavors and permium Ceylon tea, giving the tea a subtle fruity taste. A wonderful combination for a winter's day or a great iced drink to enjoy in the summer months. Comes in a decorated softwood chest containing 25 tea bags. Good tea. I buy it for my grand daughters.Plus they like the cool box. I bought my first of your blueberry tea in The Acadia Shops in Maine. I have savored every drop and was happy to find you on line so I could order more. The aroma is like warm blueberry sauce and the flavor has a subtle hint of blueberries without being sweet. I love it, especially now that our mid-west winter has arrived with a vengence.